American Indians relied on herbs, food and rituals to stay well and promote healing. 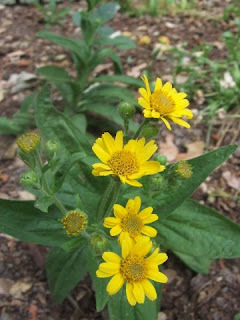 One herb they use to soothe backaches and bruises is arnica. Science proves that this herb blocks the action of histamine, a chemical released by the body that causes inflammation. Arnica also contains pain-relieving compounds. And that combination is powerful enough to ease even chronic aches. Even carpal tunnel sufferers who took the herb attest that they experienced significantly less pain without side effects. To soothe backaches, massage an arnica ointment or gel into your sore spots. hmmm...good info liz:) good day! This is really terrific as I know many people who suffers from some kind of pain ailments. I've never heard of this herb before but definitely will google more about it. Thanks for the great post! What a great tip. I've not heard of this but if it can relieve the pain, it's well worth trying. fantastic, can it be bought at a health food store? Nice tips liz...I prefer to use herb to pain relief compared with chemical drugs. Is this available in local health store ??? Thanks for such a nice post. Herbs are considered to be the best for the treatment of aches and pains. These herbs are better option than the chemical compounds as these herbs don't have any side effects. I generally use herbs in pains and aches on skin. They really help a lot. These are just great tips to cure diseases with herbs. Herbs are better than the antibiotics as it has no side effects. Herbs are totally natural and they have no effect on the human body. so, I prefer to use herbs in case of pain and other skin treatment. I love finding ways to cure any sickness or illness using natural remedies! It's so much better for you than straight ibuprofen (liver killer!). And I totally just found this one site that gives great advice. I think it's about ibogaine treatment. It's probably worth looking up if you're into natural remedies.